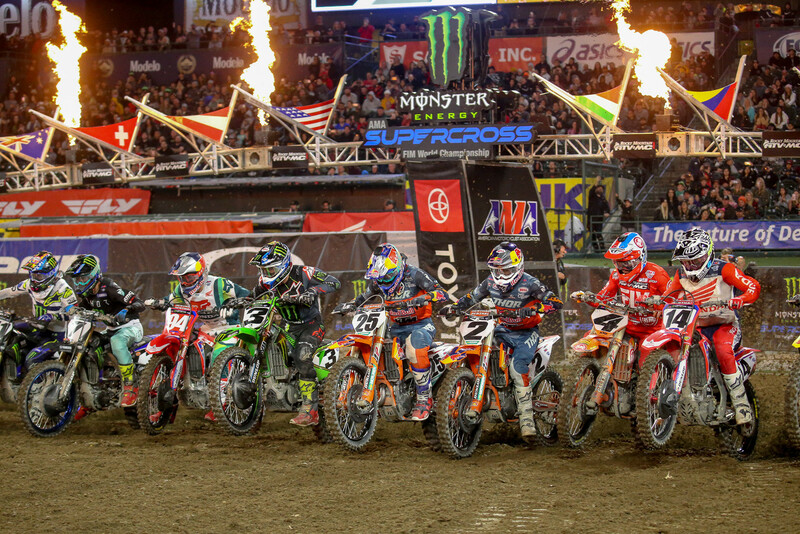 Heading into the third round of the 2019 Monster Energy AMA Supercross series I had almost guaranteed the pre-season favorites would be standing at the top of the podium, but not so fast. Cooper Webb pulled an upset that rivaled Buster Douglas knocking out Mike Tyson. Before all the Webb fans lose their mind, let me guess…you knew it was coming? Webb has not been a contender in the 450 class unless the track is muddy. His last two years with Yamaha were less than stellar, and his social media beef with Ken Roczen was laughable (until Ken’s hand went through Webb’s wheel at San Diego, which was not funny at all). Two years ago, Webb was the most anticipated rookie, so much so that Monster Energy Yamaha decided to start building a race team again. Yamaha had pulled their factory effort in exchange for helping multiple independent teams prior to 2017. Webb was one of the catalysts that caused the JGR Team to switch from Yamaha to Suzuki, as they had been anticipating Webb joining their team and imagined enjoying years of glory that he would bring. Instead, Yamaha chose to keep the “can’t miss kid” for themselves and brought in veteran Chad Reed to “mentor” Webb. Unfortunately, Reed’s influence was almost entirely negative. I spoke to some people close to the team and they were not happy with how the team dynamics played out during the 2017 season. Webb’s highly anticipated 450 rookie debut quickly faded into a forgettable season. He eagerly awaited the redesigned 2018 Yamaha YZ450, as this bike was believed to fit him and solve the problems of 2017. While the bike was much better, Webb’s new teammate Justin Barcia was the one proving the bike’s improvements to fans and team personnel. Webb’s 2018 season became as forgettable as his 2017 season. The once highly anticipated prospect had lost his shine and Yamaha was turning their focus to another younger prospect, Aaron Plessinger. Heading into 2019, Red Bull KTM, who was outbid for Webb’s services in 2017, was finally able to secure the prospect they once coveted, at a much lower price tag, too. Hearing that Webb was changing teams, trainers, and moving to Florida left me questioning, is he still chasing the glory he expected in 2017, and was that still even a possibility? At first it appeared his career was going down the same path as Broc Tickle (race results, not drug tests). I honestly didn’t think Webb would realize his early potential, and assumed his results would mirror his previous two seasons, but I’m always happy to be proven wrong about a rider’s career trajectory. The sport needs dedicated personalities like Webb. 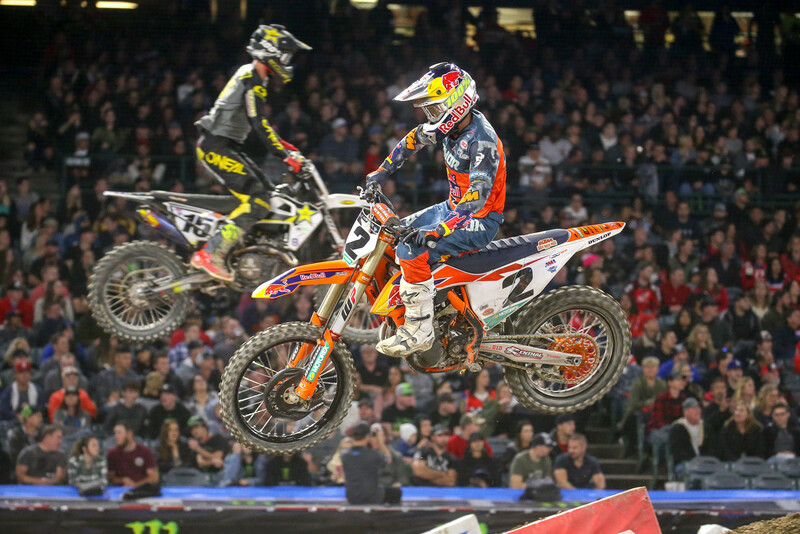 Not only did he win his first main event with a late-race pass, he turned and taunted Roczen as they crossed the finish line. When I asked him about it in the post-race press conference and he downplayed the situation, but with a rider like Webb the emotions will always shine through. The sport is hungry for more authentic storylines and Webb will surely provide them. 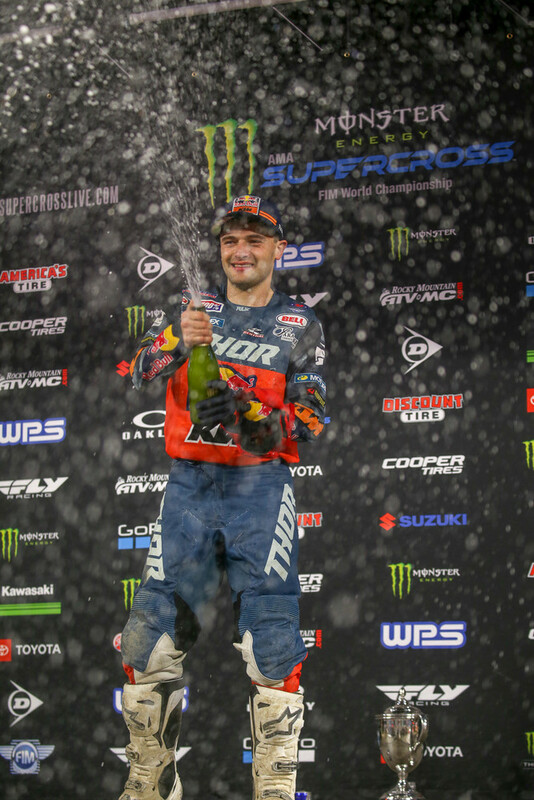 Alright, maybe Cooper Webb getting his first win wasn’t as big of an upset as Buster Douglas beating Mike Tyson, but it’s definitely a big deal! If you had picked Webb to win the Triple Crown, please make sure you have purchased lottery tickets because luck is on your side. Next up is Oakland. Is it reasonable to assume that one of the preseason favorites has to get a win? Sooner or later these goliaths of the sport need to start reaching the top step of the podium… Right? Or will this season of underdogs and the unexpected continue to triumph? Actually it was three. Webb wins Oakland IMO. and he qualified pretty damn good in Glendale, came from last to 5th at A1, too.